Eth0: Power over Ethernet port. The default address is 192.168.1.150. PoE capable. Eth1: Ethernet administration port. It uses the address 172.16.0.1. Provides a 172.16.0.x IP address. Power requirements: 7V - 20V DC (PoE or DC in). Expansion ports: Minipci – Minipci Express (usb mode only). In order to start sending data we need to follow a 4 step process: configure the network, register the gateway, configure the meters and verify the reception. Connect the network cable to the eth0 connector. Prepare your computer to obtain a IP address using DHCP or assign an IP in the 172.16.0.2-254 range. Connect another network cable to our computer and the eth1 connector. Open your web browser and access http://172.16.0.1. Insert the SIM card before powering the DEXGate. It takes a few minutes for a message to be processed and visible in www.dexcell.com. Although you can check if the messages have been obtained from the meter and send in the "Debug" section of the web administration interface of the DEXGate. NTP time synchronization: enable it to synchronize the time regularly with internet time. There are 2 wired network interfaces: eth0 and eth1. Eth1 is not configurable and it's set to 172.16.0.1. Eth0 can be configured to use DHCP or to use a static IP address. Please contact your systems administrator to obtain the configuration. 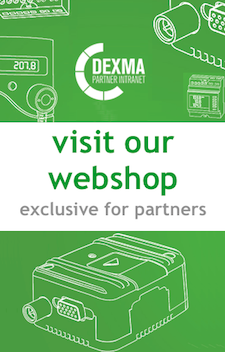 DEXGate can be remotely administered by an engineer from DEXMA in order to diagnose several problems. In order to accomplish that the DEXGate establishes a VPN connection that allows bidirectional connection. This VPN connection uses the port 1196 UDP. The DEXGate needs to be registered in order to connect to the VPN server. The DEXGate is prepared to connect to vpn.dexcell.com. If you need to connect to another server you'll need to update the certificate to be able to connect to the new server. You can download it from the server or upload it manually from your computer. In this section you'll find the state of various bridges. You need to refresh the webpage in order to update the values. The delay param is the time in ms between each register reading. Initial-register (address) is the initial modbus register (a integer between 0 and 65535). Dexcell-service is the dexcell service identificator. You can find them here. It can be very useful if, for example, we want to get the data in kW instead of W. In this case you will have to set the value to "divide"
5. Operand is the operand of the operation. For example, in the kW to W case, we would set the operand value to 1000 to set the divisor of the operation to 1000. This sections are designed to reboot and halt the device. It is recommended to use this option instead of directly removing current from the device. Change the password required to log in the administration interface.